Most people expect to cope with emotional grief when a loved one dies, but not many understand how to deal with the financial stress of planning (and paying) for their funeral. Recent statistics show that the average cost of an adult funeral is almost $8,000, so it makes sense to think about how to pay for funeral and burial costs before the inevitable happens. 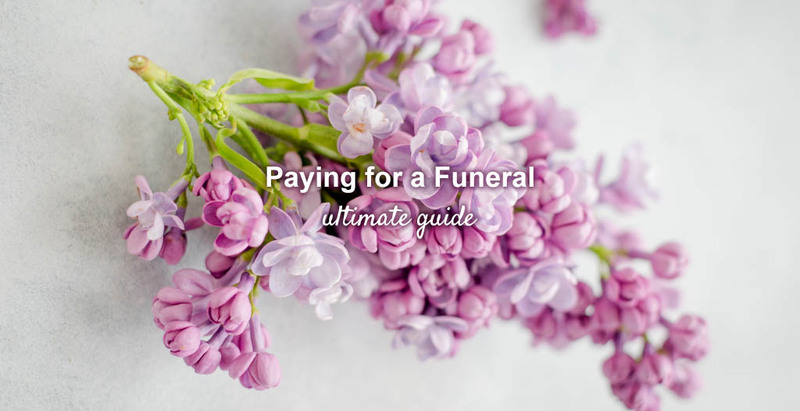 Paying for funeral expenses with cash or a valid check is always acceptable, but if you don’t have thousands of dollars on-hand, here are some helpful ideas on how to pay for a funeral. If your loved one had a life insurance policy, the designated beneficiaries of the contract can file a claim for the proceeds. The insurance company will require a death certificate and completed claim paperwork before making any payments, and total amounts and processing times can vary. That said, depending on the circumstances of the death claim, most life insurance companies make an effort to pay out benefits within 30 days after the death of the insured person (although it can take up to 60 days or more in some cases). Filing a claim for life insurance death benefits is fairly straightforward. If you have life insurance and pay the premiums on a regular basis, make sure you document the policy information (including beneficiary names) in a secure location. Inform a trusted family member or your estate executor so that they can access your policy in the event of your death. You can also include life insurance details as part of your end-of-life arrangements if you engage in funeral pre-planning. Paying for funeral expenses in advance makes good financial sense. The main goal of prepaid burial insurance plans is to set aside funds to cover funeral-related costs (e.g. body transport fees, buying a casket, cemetery interment costs). Pre-paying funeral costs also saves surviving family members from dealing with financial burdens during their time of grief. Final expense insurance and pre-need plans are two types of burial insurance that build a stronger foundation for comprehensive end-of-life plans. A final expense plan provides a fixed amount that can be used for funeral and burial costs, although these funds can also be used to pay for other expenses (e.g. medical bills). Funeral homes that offer pre-need contracts allow you to “lock in” prices of your selected funeral services and pay these costs in advance. Learn more about final expense insurance and pre-need plans here. A Payable on Death (POD) account is a bank account or a certificate of deposit with a designated beneficiary. In the event of your death, the beneficiary can access the account funds by providing a death certificate and proper identification. However, they have no rights to the POD account while you’re still alive. A POD account – also known as a Totten trust – can be used to pay for funeral and burial expenses. When compared to life insurance or inheritance, it’s an expedient option that’s also a great way to bypass the probate process (which can be lengthy and complicated). There’s no minimum balance required and naming a beneficiary is free, but make sure they know the POD account exists and understand how to access the funds to pay for the funeral. Many financial institutions offer funeral loans to families who are looking for funds to pay a loved one’s burial costs. A funeral loan is usually an unsecured personal loan, meaning that you don’t need to put up your home/personal property up as collateral. While it might not sound like a good idea to ever take on debt, a funeral loan can be a good option if you need money quickly and don’t have enough savings to cover funeral charges upfront. Most lenders are willing to offer reasonable rates based on credit scores and the ability to make monthly payments. Take the time to compare interest rates from banks, credit unions, and online lenders to find the most affordable plan for your budget. Also, make sure you understand what funeral costs you are paying for so you can request the right loan amount. According to The Funeral Rule (which is a consumer protection law enforced by the Federal Trade Commission), all funeral homes are required to provide customers with an itemized price list. This ensures that you can create your own funeral budget by choosing and paying for specific services. Service-related death – Up to $2,000 for deaths occurring on or after September 11, 2001. If your loved one is buried in a VA national cemetery, some or all of the body transportation costs may be reimbursed. Non-service-related death – Up to $780 for deaths occurring on or after October 1, 2018 (if the deceased was hospitalized by VA at time of death), or $300 (if not hospitalized by VA at time of death). VA burial benefits are paid as a reimbursement, so you will need to show proof of death, valid receipts, and/or an account statement from a licensed funeral home. In addition, the U.S. Department of Defense provides eligible surviving spouses and children a special tax-free payment of $100,000 if their loved one died while on active duty or in a specific reserve status. This “death gratuity” is usually a cash payment that is immediately payable upon death, and can be used to pay for the surviving family’s day-to-day needs (as well as funeral and burial expenses). The U.S. Social Security Administration provides death benefits to a surviving spouse, based on specific eligibility requirements. A one-time payment of $255 is available if the surviving spouse was living with the deceased in the same household. If they were living apart, the surviving spouse is still eligible to receive death benefits if he or she was already part of the deceased person’s account during the month of the death. If there is no surviving spouse, the payment is distributed to the deceased’s child or children. Although $255 might not seem like a lot of money, it can still help cover funeral costs. Eligible spouses and children must apply for the payment within two years of the date of death. Call your local Social Security office to learn more about the application process. If your loved one dies abroad, the U.S. Department of State Bureau of Consular Affairs offers logistical information on how to return the remains to the United States or arrange for local burial. They do not, however, provide any financial assistance related to this process. Not all employers offer death benefits to their employees, but those who do usually offer certain benefits when a worker dies. These amounts can include accidental death insurance, life insurance, workers’ compensation, and survivor payments based on the employee’s years of service. If your loved one died from a work-related injury or illness, workers’ compensation survivor benefits can help cover a significant portion of funeral costs. Usually, the deceased’s spouse and children receive these benefits, but eligibility requirements are determined by state law and the total amount varies by location (For example, workers’ compensation in Ohio provides up to $5,500 for burial expenses). In most cases, the deceased’s executor is responsible for contacting current/prior employers to both notify them of a worker’s death and to request any available death benefits. The executor will also need to provide a death certificate. It’s unlikely that employer death benefits will be paid out quickly or assigned to the funeral home, but the funds can be used to reimburse burial expenses when they become available. It’s not easy for one person to be 100% responsible for paying for a loved one’s funeral and burial costs. If you’re having financial difficulties, consider asking other family members to contribute funds to cover various expenses. A memorable service doesn’t need to be expensive. In fact, there are ways to plan an affordable funeral while keeping it dignified and respectable. Don’t dictate how much family members should contribute towards funeral expenses. Every little bit counts and people shouldn’t be pressured into giving more than they can afford. The loss of a loved one is a traumatic experience for everyone, so tread carefully and try to avoid family conflict when making funeral arrangements. Crowdfunding is a simple, cost-effective way to raise funeral funds. Almost everyone has access to a computer or smartphone nowadays, which makes it easy to craft a successful crowdfunding campaign and quickly send it out to family, friends, co-workers, acquaintances, and anyone else who knew the deceased. You can use one of the popular crowdfunding sites like GoFundMe, or even set up a campaign on Facebook. There are also various funeral-focused crowdfunding platforms (e.g. MyRespects.com) which work with families and funeral homes to ensure that raised funds cover funeral and burial costs. Starting a funeral crowdfunding campaign is free, but you will likely need to pay processing fees based on the total amount of funds collected. One of the best ways to save money on funeral and burial expenses is simply to understand the costs of the products and services provided by a funeral home. We strongly recommend doing your research and working within a budget. You don’t need to pay for all the services on offer – select only what you need (e.g., opt out of embalming if unnecessary, choose cremation over a traditional funeral service). Learn more tips for saving big on funeral expenses here.